I’ve had the Garmin 500 for two and a half years. It has many good features and represents a huge step up in terms of cycle computer technology and possibilities. The ubiquity of the Garmin 500 within the cycling community is generally well deserved. However, it is not without its faults, which I will come to later. This includes parts of the initial review from 2012, but more of the faults which have become apparent in using it. Firstly, the Yorkshireman in me was always been reluctant to contemplate spending £170 on a glorified speedometer. But, when I took the plunge, I kind of regretted not buying it a few years ago, when it first came out. 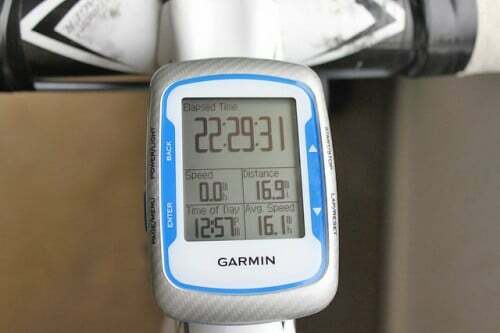 The Garmin 500 is expensive, but it has made all my other speedometers redundant. The irony is over the years, I’ve bought so many speedometers that I’ve probably spent over £100 on them (I found old speedometers quite unreliable). The main thing about the Garmin is that it gives you a wealth of data, that can be easily downloaded to your computer. Data that previously had never been accessible. The Garmin itself is very stylish and fits nicely onto my handlebar stem. Everything about it is easy to use. It clips on and off very easily and can be switched between bikes. It is very easy to set up (unlike most cycle computers I had). For example, it was always difficult to set the time on my old cycle computers. The clocks were always very unreliable and ‘nearly impossible to change. When doing a race, I was always subtracting around 40 minutes to know my start time. GPS time is very accurate – and you never need to reset it. It does it automatically. Garmin 500 right is more stylish than 510 in my opinion. You can customise what shows up on the three display screens. It looks really good. It’s not too big and flashy, but a nice addition to your bike. You only need one computer for several bikes, just buy a few more handlebar mounts. It’s great being able to see the gradient that you are climbing and the altitude that you are at. Plus the usual elapsed time, time of day and average speed. Climbing and and descent data, Altitude, gradient, changes in elevation Edge 500′s barometric altimeter pinpoints changes in elevation. Temperature – though I find this pretty inaccurate. Heart Rate – some models come with additional heart rate and cadence functions. I bought a Garmin heart rate strap, when I was measuring HR last year. GPS on iPhone was more likely to be unreliable at critical times. The Garmin 500 is lighter and more dignified than stuffing an iPhone down your skin suit where it usually ends up in your nether regions. The battery lasts up to 12 hours on a Garmin. When you switch GPS on an iPhone it can wear down battery very quickly. You can have several functions on the same screen. There are 3 screens to scroll through – giving a seemingly infinite range of indicators to choose from. No battery can be recharged from USB. 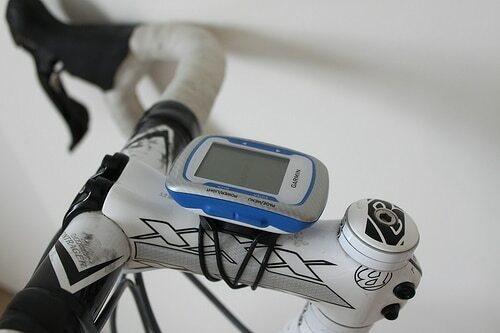 The Garmin Edge is a touch screen version with GPS mapping. It is particularly useful for offering all kinds of trails and off-road maps. It can be used with gloves. It’s RRP is £399. The kind of price, which could buy you a new bike. You would really need to use the GPS mapping service frequently to make this worthwhile. There are problems with my Garmin 500. Ensure the device is off and no cables are connected to it. Connect the device to the computer at the same time as holding the POWER button. However, recently, the Garmin 500 failed to connect to computer, even using this. After trying for a few days, I gave up and bought a new Garmin 510. Of course, as soon as I bought the Garmin 510, the Garmin 500 started working again (in its own temperamental fashion). 2. Takes a long time to pick up GPS signal. 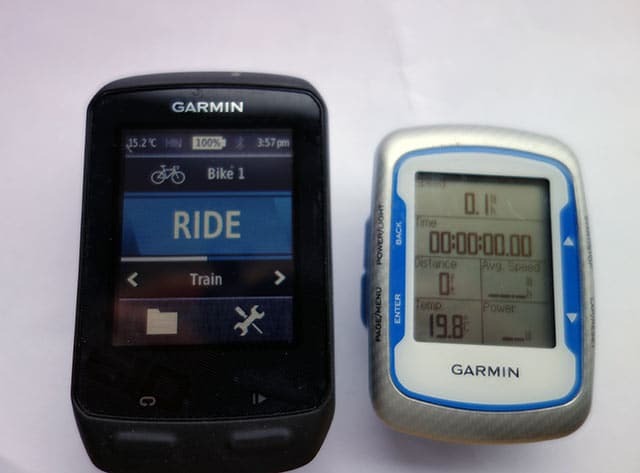 It can take a long time to pick up GPS signal and start (compared to new Garmin 510). To me, this is not a big problem though. 3. GPS is inaccurate. Comparing my times in official hill climbs to GPS segments, the Garmin 500 was always 2-4 seconds slower than it should have been. Often it didn’t pick up segments because it takes time to get going. This is a bit irritating. 4. Often you would turn your Garmin on, and it would be the dreaded 2% battery level left. This isn’t really a fault of Garmin – it’s my fault for not turning it off properly. But you would have thought they could have had an auto-power off when not in use – rather than needlessly draining the battery. Also, it was very hard to check battery level, without turning it off and turning it back on. I am happy with purchase, despite wallet being £170 lighter. It’s not every year I will spend this kind of money on a speedo, but hopefully, this will last several years. It was unreliable in GPS signal. It was a real pain in connecting to computer. If these two things had been fixed and not a problem, I would have given the Garmin 500 a glowing review. But, I feel when you pay this kind of money, you should have better quality. So I’d give it 7/10 – which is very generous given I have more or less had to give up on it after 2 years. I’ve had a Garmin for about the same length of time. It was replaced FOC by Garmin about 18 months ago after the screen display became erratic, often showing half of two separate screens at the same time. My current model occasionally, if only briefly repeats this fault . I agree that sometimes it takes a long while to achieve full satellite link up, but have often set off without waiting for this to complete but it has always logged my entire ride. The review States 3 separate screens. Having updated the software, available free from Garmin, I now have five screens available, providing multiple functions of data on each screen. I agree however that the temperature sensor is way above the actual air temperature. All in all worth the outlay. At the moment I have stopped short of purchasing an Edge 810 with full mapping, relying instead on my smartphone if I Need maps. IF you still have that annoying Garmin 500 I will take it off your hands so you don’t have to lament about it’s purchase. Also with the latest firmware 3.30 there is an auto-off feature. Fortunately my USB cable works better, while I wouldn’t mind a wireless sync feature but a worse visibility screen of the 510 would be unacceptable, plus the size of the 500 is a big as anything I wanna put on my bike, very subjective I know. I’ve ad my Edge 500 since May of 2012. I average 25 days of riding each month since 2012 and I’ve never had one problem with my Edge. I have a fried who has had one but he is abusive, in my opinion, in handling the edge (seems to drop it occasionally!) I have been extremely pleased and will continue to use this device to track my exercising and monitoring my health. Knock on wood, I suspect the battery will not last much longer but it has been GREAT! No problems. Only complaint for the 500 series was the the battery replacement. Not easy to replace but restored my speedo’s power capacity back to like new. Getting 8-10 hours of usage after a charge. – Watch the video on YouTube 1st at the URL that they mention in the instructions. – The old battery was quite well glued onto the case and took a lot of prying to take up. I put a piece of double stick tape to retain the new battery. – Since I have a good soldering iron, I unsoldered the old leads and resoldered them back in instead of splicing as the video suggested. These leads are to the speaker, not the power, which plugs onto the PCB and is a direct replacement for the one on the old battery.